It's only the second day of having a blog to call my own and already I'm suffering from blogxiety. What if I have nothing to say? This is a tremendous responsibility, this blog launch. Even if I have no readers, I can still experience blogxiety. Fifty years of therapy. It'll take 50 years of therapy to unblock the inner blogger; I can tell. On Friday I watched Metallica: Some Kind of Monster. Heavy metal gods are apparently sensitive souls, despite all of the cruddy tattoos, demonic salutes, and bad-boy snarls. Lars and James had enlisted the aid of a life coach/therapist named Phil. Forty thousand dollars a month they paid Phil to help them overcome their various and sundry dysfunctions. Meanwhile Phil's issuing platitudes and hanging on to the band like a remora. It made me nervous just to watch it. "Dump Phil," I shouted at the TV. "Get rid of the guy. For godssake! You don't need him. 40 grand! A month!" No wonder they're fretting about the Napster stuff -- they've got this expensive therapist to support. So now the therapy required to overcome my blogxiety is making matters even worse. I'm twice as anxious. Or maybe it's geometric and I'm 4x as anxious. I'm starting to break out in a rash I think. It's still invisible, the rash, but that doesn't mean it isn't there. My skin's tingly and it's only a matter of time until I get the redness and bumps. Anyone who knows me very well is probably just shaking his or her head. I'm the kind of person who makes it an out-and-out challenge to end a phone call. You might tell me, "ohmygod! I've got to run! The dog's on fire and I'm two hours late to my own trial. I hope they don't give me the death penalty." And I'd just say, "Oh, yes. I had no idea it was so late. I'll let you go now. Got a lot to do myself. I've left my knitting mid-row." 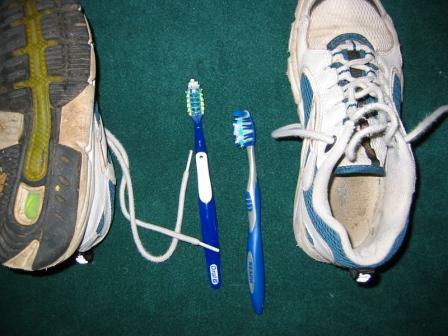 Then, before you can politely end the conversation, I'll proceed to tell you my latest theory about how toothbrushes and running shoes (trainers to you Brits) are designed by the same design firm consulting the same focus groups. No kidding. You gotta look. See: magenta, turquoise, and teal accents; gel inserts; swoopy bits; high-low nubbly textures. Put 'em side by side (as close as you dare, depending on your standards of hygiene). No, really. Try it. You'll see. Factor out the difference in function and aren't they pretty darned similar? So how does a person capable of causing Carpal Ear Syndrome reach a state of extreme blogxiety, one that'll cost at least 40K/month to straighten out? I dunno. Maybe that's a second topic for This Week on the Couch. Wonder if Phil can cut loose with an extra 15 minutes.